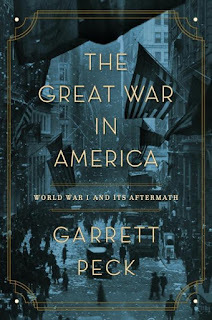 Garrett Peck is the author of the new book The Great War in America: World War I and Its Aftermath. 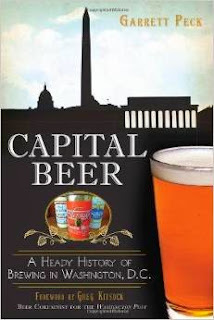 His other books include Walt Whitman in Washington, D.C. and Capital Beer. He lives in Arlington, Virginia. 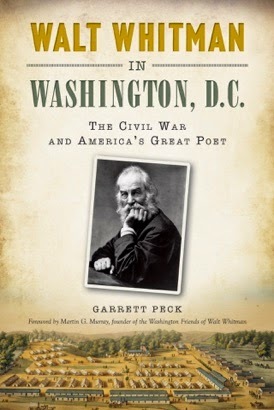 Q: You begin the book by writing, "The Great War of 1914 to 1918 was the most important war of the 20th century." Why do you think so? A: World War II captures so much of the American imagination - we considered it the last “good war” - and it kicked off the so-called American Century. If you watch the History Channel, it’s full of programming about ancient aliens, Adolf Hitler, and WWII; there’s nary a word about WWI. Yet you wouldn’t have World War II without the First World War. The second war was literally the bloody sequel where the issues and resentments caused by the flawed peace treaty came back to haunt the next generation. World War I is so important in that, by its end in November 1918, four global empires had fallen (the Austro-Hungarian, German, Ottoman, and Russian empires); Bolshevism was unleashed on the world; and the modern Middle East map was drawn by the British and the French, to lasting resentment in the Arabic world. As we’ve learned throughout history, no one wants to be colonized. We thought we were going to save the world from itself, defeat autocracy and militarism, and build a new world order that would prevent future conflicts. Many called the Great War “the war to end all wars.” Sadly that did not turn out to be the case. The United States got involved late in the war - we were only in it for nineteen months - but we drafted 4.7 million young men and sent 2 million of them overseas to fight in Europe, something we had never done before. It was an incredible achievement. In the end, we defeated the vaunted German army and earned a seat at the peace table. But that’s where things really went wrong. The Treaty of Versailles was a flawed peace, and it led to the next war. The U.S. never ratified the treaty, as we got into a huge partisan squabble between President Wilson and Senate Majority Leader Henry Cabot Lodge. Our country retreated back into our continent, we never joined the League of Nations, and we refused our global role. It was like the country was too immature to accept that it had global responsibilities. Instead, the country simply wanted to move on and forget about the war. Many people thought getting involved in the war was a mistake. Thus its lack of memory in America history. Q: Given the scope of the war and its aftermath, how did you decide what to focus on in the book? A: Europeans are devoted to Great War history, as the war was absolutely devastating. Americans meanwhile practically worship the memory of WWII, as it was a moment of great victory and hegemony for the U.S. 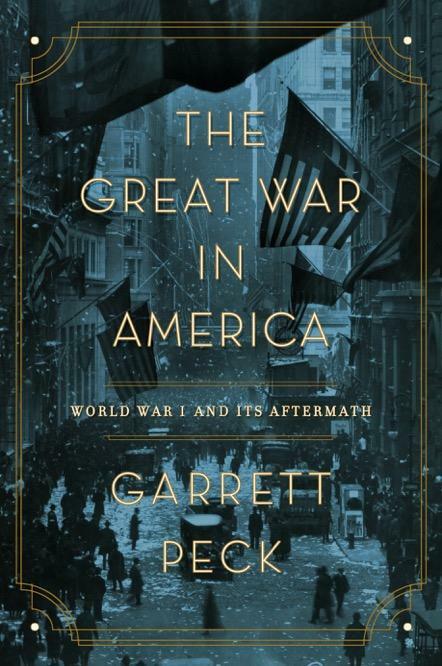 I came to see that there was a great gap in our understanding of the importance of World War I in America history, and thus I wanted to focus on this too-overlooked war and the consequences that resulted from it. My publisher, Pegasus, and I timed the publication for the centennial of the Armistice (Nov. 11, 1918), when public awareness of the war’s outcome would be greater. War is like opening Pandora’s box. Once you open it, you have no idea what the outcome will be. In the U.S., we experienced the hubris of victory, followed by failing to ratify the peace treaty. We experienced fierce race riots and our first-ever red scare in 1919. We got Prohibition because of the war. And one good outcome: women earned the right to vote because of their participation in the war effort. All of these things happened explicitly because of the war, and I felt they earned a place in my book. Q: How did you research this book, and what did you learn that particularly surprised you? A: I overwhelmingly focused on primary resources for this book. The single largest source was Woodrow Wilson’s papers, and he is the leading character of the book. There were many other voices I included as well: Secretary of the Navy Josephus Daniels left us his cabinet diaries; Wilson’s secretary Joe Tumulty kept detailed notes of their conversations; and political advisory Edward House’s diaries are likewise preserved. I also wanted to include many contrarian voices - people like H. L. Mencken, who was solidly opposed to the war, and pacifist Eugene Meyer. It was important to note that the country really didn’t achieve national unity during the Great War; rather, the dissenters - who were a considerable minority - were simply silenced until 1920 or so. When you take on a big topic like this, you go down the rabbit hole like Alice in Wonderland. You never know where you will end up. One of the surprising things I learned was how Jazz became a national phenomenon during the Great War, as hundreds of thousands of Southern African Americans moved North to work in factories, taking Jazz from New Orleans to the country’s metropolises. Jazz seemed to explode overnight, and of course it became the soundtrack for the 1920s and Prohibition (Scott Fitzgerald named it the “Jazz Age”). It was also a form of protest movement against the treatment of African Americans in our country at the hands of lynch mobs, race riots, and societal discrimination. Another surprise was how the British used the Zimmermann Telegram to effectively manipulate the U.S. into entering the war in April 1917. This was one of the great intelligence coups of the 20th century, and as it turns out, the British intercepted the controversial telegram - the Germans offered an alliance with Mexico and Japan should the U.S. declare the war - at the U.S. embassy in London itself. The British were listening in on our communications. I wrote an entire chapter about the decision to go to war, and this figured prominently in the decision, along with the German submarine campaign. I was also curious to discover how widespread dissent was at the time against the war, but how those dissenters like H. L. Mencken were silenced until the crisis of the war passed. We didn’t have a major First Amendment case before the Supreme Court until 1919, and there were simply few guardrails at the time to protect dissenters. President Wilson’s administration made war against the far left, including the Palmer Raids to round up and deport thousands of anarchists, communists and socialists. The American Civil Liberties Union formed as an outcome from this, of which I am a proud card-carrying member. There are many more surprises than this in the book, but I don’t want to give them all away, nor take away the joy of reading a book! Q: A century later, what would you say is the legacy of World War I? A: The legacy of World War I is that war is a terrible way to resolve conflicts, though not always avoidable. The human and financial toll of war are quite high, while diplomacy is vastly less expensive and often much more effective in securing the national interest. President Wilson was a prophet for democracy in his advocacy for democracy abroad - what we today call “Wilsonian diplomacy.” He envisioned the world at peace and attempted to build a global framework that would mitigate future conflicts through the League of Nations. He fell short of this goal - the U.S. never ratified the peace treaty nor joined the League - but the seed was planted. President Harry Truman, who was a proud student of history and a WWI veteran, picked up where Wilson left off. He understood that the failure of the peace in 1919 had led to another brutal war, and that we had to do something different: rebuild the economies and societies of our enemies and implant democracy in them, which is what we did with Germany, Italy and Japan after 1945. He also championed the United Nations (the successor to the League of Nations) and built the institutions that enabled the U.S. to win the Cold War: the Marshall Plan, the North Atlantic Treaty Organization (NATO), and promoted free trade that helped billions of people emerge from poverty and war. I daresay that, with the global populist backlash we are currently experiencing, many of those institutions feel like they are under siege. Yet the world is a dangerous place, and we Americans have benefitted tremendously through our alliances with our fellow democracies and through trade. Both have extended our power into the world. We should not be so quick to toss our allies and trading partners aside. American First really means America Alone. A: I’m writing a history of the first decade of the 21st century in America. It’s called The Lost Decade. The period was bookended by two major financial crises: the Dotcom Meltdown, and the Great Recession. A lot happened in between: Dubya, 9/11, the Iraq War, Hurricane Katrina, the housing bubble, the rise of the internet as the national pastime, the advancement of gay rights towards equality, a changing planet (both in terms of climate change and globalization), and changing demographics of our country. We all lived through this time, and I think a lot of explains where we are today with our tribal political polarization. I hope to have it out in 2020. A: In addition to writing books, I’m also a tour guide and historian. For The Great War in America, I created a walking tour of WWI-related sites in the nation’s capital. 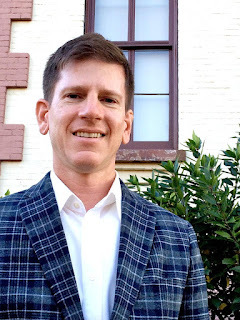 The next one will be April 14, 2019 through Politics & Prose. More events and tours are on my website. --Interview with Deborah Kalb. Here's a previous Q&A with Garrett Peck.